Shirts With Random Triangles: Hugh Freeze to change play calls following administrative intern's defection to Auburn. Hugh Freeze to change play calls following administrative intern's defection to Auburn. Hugh Freeze and Guz Malizahn. Photo via al.com. To every action there is an equal opposite reaction. What goes for physics also goes for college football, as the movements of a former quarterback-turned-administrative intern-turned-graduate assistant is resulting in Ole Miss head coach Hugh Freeze having to change is play calls. Ryan Aplin is a former quarterback of Arkansas State. He played two years under Hugh Freeze, then one year under Guz Malzahn when Freeze went to Ole Miss. Aplin then became an administrative intern under Freeze at Ole Miss. Aplin has now left Freeze's coaching staff to become a graduate under Malzahn at Auburn. This is resulting in Freeze taking no chances and changing his play calling so as to counter any potential sharing of playbook secrets by Aplin to Malzahn. 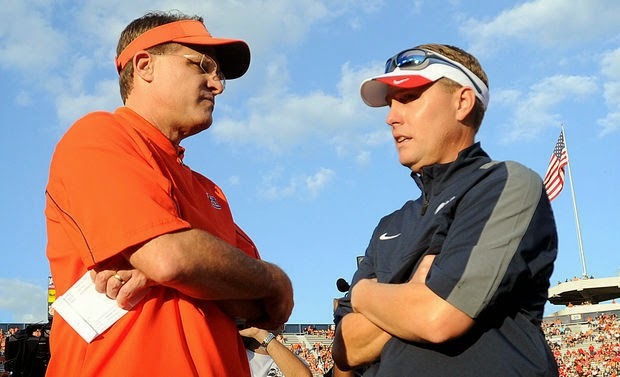 Freeze expressed his regret that Aplin was making the move from Ole Miss to Auburn on Tuesday. "I think I'm getting ready to lose another one to Auburn and I can't stop the young guy because I don't have a spot for him and they do," Freeze said Tuesday, hinting to Aplin's departure. "We all love the guy." Malzahn is also high on Aplin's potential. He stated last fall before the Tigers' win over the Rebels that he thought Aplin would someday become "a big-time college coach." Covering Dixie: Todd Gurley, Les Miles, and more. Nick Saban gives Will Muschamp a show of support. Riley Ferguson is an ex-Tennessee quarterback. Your Facebook fail of the day. LeBron James wearing a Johnny Manziel jersey. Big Tentacles: Purdue, Iowa, and recruiting.